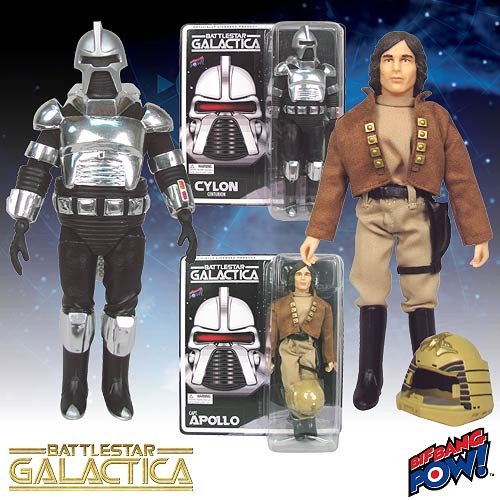 Retro-style action figures of Captain Apollo and a Cylon Centurion. Direct from the 1978 science-fiction television series Battlestar Galactica, these 8-inch scale action figures feature multiple points of articulation, episode-specific fabric clothing, and a retro style reminiscent of the bestselling "Mego" action figures of the 1970s and 1980s. Continuing Bif Bang Pow! 's successful partnership with EMCE Toys, they bring the show's most popular characters to 3-dimensional life for BSG fans new and old! Arguably the central character of Battlestar Galactica, Viper spacefighter pilot Apollo (as portrayed by actor Richard Hatch) heads up this 2-pack. Dressed in authentic BSG attire that includes pants, jacket, belt, and boots, Captain Apollo's accessories include a well-detailed pistol and removable helmet. Commander Adama's son is joined by a fearsome Cylon Centurion, armed to the teeth (do they have teeth?) with both a rifle and a sword. Hyper-detailed in metallic-silver and black, this 8-inch figure is one to keep your eye on!